Want long voluminous tresses?! G Michael Salon knows what your locks have been craving! 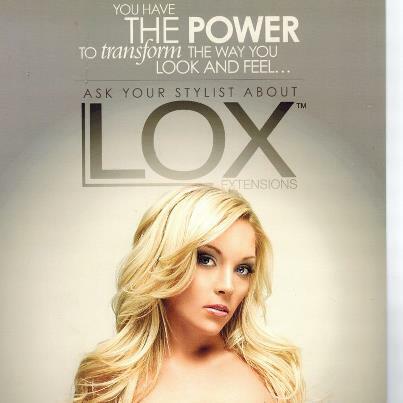 Achieve beautiful fullness and sweeping length with LOX extensions – NOW AVAILABLE at G Michael Salon! LOX Hair Extensions are 100% Remy Human Hair—the finest quality hair available in the world. With 39 color options available, and various lengths and textures, you can have the long flowing gorgeous locks that you have always dreamed of! At G Michael Salon, we can assist you in choosing the best length, shade, and texture of hair extensions for the look that you desire. LOX Hair Extensions are applied without wax, heat, glue or tape, causing no damage to your natural hair during the application process. The extensions actually function on a “loop” system, which involves a silicone-lined bead being attached to your actual hair shaft. This beaded system allows for the extension to be moved upward on the hair shaft, just about every 6-8 weeks as a “maintenance” session, which can conveniently take place during your normally scheduled haircut/color services. This maintenance session allows the wearer to prolong the life of the extensions which is unlike any other hair extensions available on the market. Application takes 2-3 hours, (including time allotted for the extensions to be blended/cut with your own hair). You should be able to wear these extensions for about 5-6 months, possibly longer depending on your personal commitment to care for the hair. The cost for the extensions depends on each guests existing hair density and length and will be quoted upon consultation. Call G Michael Salon in Noblesville, Indiana TODAY and find out…….what your locks have been craving!